BMW is showing five new models at the 2013 Frankfurt International Motor Show this week, including the i3 and i8 from BMW’s latest model range, the new BMW 4-Series, the facelifted BMW 5-Series and the heavily revised BMW X5. The German manufacturer’s stand is dominated by the new “i” badged machines that form part of the German marque’s environmentally friendly sub brand. The i3, which was formally unveiled in July, is an all-electric city car that will rival cars like the Nissan Leaf, Renault Fluence and Renault Zoe, and the i8 is a plug-in hybrid sports car that is making its public debut at the Frankfurt event. The i8 is a 2+2 which is constructed from a carbon reinforced chassis and powered by a 1.5 litre 3-cylinder turbocharged petrol engine that offers a total of 362bhp and 420lb-ft of torque when coupled with the electric motor. 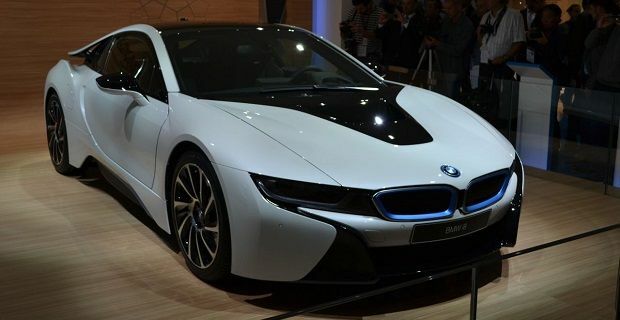 The i8 will sprint from 0-62mph in 4.4 secs and yet the electric motor allows for economy of 94mpg. The charge time is less than 4 hours from a 110 volt source but a BMW Charging Station will cut this to just 90 minutes. The BMW 4-Series was probably the most eagerly awaited BMW by press and public during the lead up to the Frankfurt event as information about the car has been around since June. The new machine is longer, wider and lighter than the current 3-Series Coupe and when it’s released three versions will be offered – 428i, 435i and 420d. BMW is also using the Frankfurt event to showcase the new look 5-Series which has received a facelift to keep in competitive with younger rivals. The X5 has been more heavily reworked and the addition of a two-wheel drive to the range will divide opinions. Three engine choices will be available when the rear-wheel drive version hits the road - xDrive50i, xDrive30d and M50d.